The new criteria wording—“Height is measured from the level of the lowest, significant, open-air, pedestrian entrance to…” allows for the recognition of the increasing numbers of multi-use tall buildings with often several different entrances at different levels, whilst also accommodating buildings constructed in non-traditional urban or suburban locations. 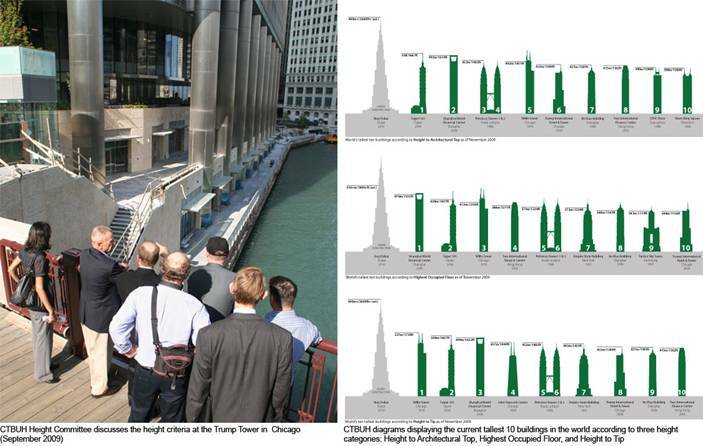 The CTBUH Height Committee has determined that the previous description of where to measure tall building height from—“Height is measured from the sidewalk outside the main entrance to…” is now no longer sufficient. This will have an impact on both the height of tall buildings and their relative international height rankings. Burj Dubai, set to open as the world’s tallest building in January 2010, will now be measured from the lowest of its three main entrances (which opens into the entrance lobby for the tower’s corporate suite office function), while the recently completed Trump International Hotel & Towers in Chicago will be measured from the lower, publicly accessible Chicago Riverwalk. In the case of Trump, this additional 27 feet means that it will surpass the Jin Mao Tower in Shanghai to occupy the rank of 6th tallest on the current list of completed buildings. 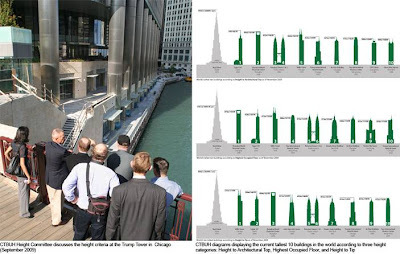 The revised CTBUH Height Criteria and diagrams of the tallest 10 buildings in the world as of November 2009 can be found at criteria.ctbuh.org, ranked according to the three height categories now recognized by CTBUH. These are: (i) Height to Architectural Top, measured to the topmost architectural feature of the building including spires, but not including antennae, signage, flag poles or other functional-technical equipment; (ii) Height to Highest Occupied Floor, measured to the level of the highest, consistently occupied floor in the building (thus not including service or mechanical areas which experience occasional maintenance access); and (iii) Height to Tip, measured to the highest point of the building, irrespective of material or function of the highest element. 2. Highest Occupied Floor: Height is measured from the level1 of the lowest, significant2, open-air3, pedestrian4 entrance to the highest occupied6 floor within the building. 3. Height to Tip: Height is measured from the level1 of the lowest, significant2, open-air3, pedestrian4 entrance to the highest point of the building, irrespective of material or function of the highest element (i.e. including antennae, flagpoles, signage and other functional-technical equipment). 2 Significant: the entrance should be predominantly above existing or pre-existing grade and permit access to one or more primary uses in the building via elevators, as opposed to ground floor retail or other uses which solely relate/connect to the immediately adjacent external environment. Thus entrances via below-grade sunken plazas or similar are not generally recognized. Also note that access to car park and/or ancillary/support areas are not considered significant entrances. 3 Open-air: the entrance must be located directly off of an external space at that level that is open to air. 5 Functional-technical equipment: this is intended to recognize that functional-technical equipment is subject to removal/addition/change as per prevalent technologies, as is often seen in tall buildings (e.g. antennae, signage, wind turbines, etc. are periodically added, shortened, lengthened, removed and/or replaced). 6 Highest occupied floor: this is intended to recognize conditioned space which is designed to be safely and legally occupied by residents, workers or other building users on a consistent basis. It does not include service or mechanical areas which experience occasional maintenance access, etc.